Vincenzo was the father of the more famous Giacomo Giorgetti. 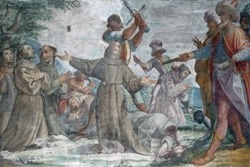 He was a prominent citizen of Assisi, where he served as a prior in 1622. 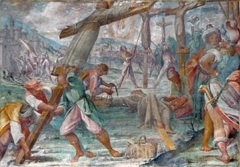 ✴he worked with Cesare Sermei on the frescoes of Chiesa del Nome di Gesù (also known as the Chiesa de' Matrigiani, now demolished -see Walk III) in 1631. The decoration of the chapels of the newly built Chiesa Nuova is attributed to a team that seems to have been led by Cesare Sermei and to have included both Vincenzo and Giacomo Giorgetti. ✴the altarpiece in the Cappella di San Bernardino da Siena (illustrated here), which depicts St Bernardino of Siena and other Franciscan saints.